Great photography shows you subjects you might well be familiar with, but presents them in a way that you hadn’t seen before; it allows you to think about things from a new perspective. In this regard the work of Edward Weston and Josef Sudek immediately come to my mind. Then there is photography that shows you things that you can’t see because of the physical limitations of the human eye. 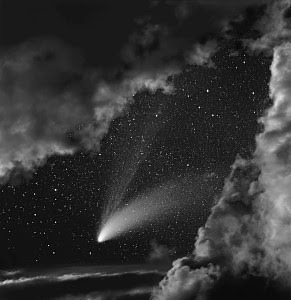 Infrared photography, astrophotography and prolonged exposures come to mind. Evaluating these type of images is a bit harder, because one has to overcome that initial ‘wow’ factor that occurs when viewing something that has previously remained invisible. But merely removing the cloak of invisiblility is not sufficient to make a photograph exceptional. One has to assess what is left when the ‘gimmick’ is removed. Are you still being shown something in a new way? Does it make you think about the image and the subject? Does it move you? 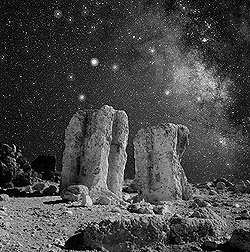 Israeli photographer Neil Folberg does all those things in his monograph entitled Celestial Nights: Visions Of An Ancient Land. Using multiple exposures, as well as various film types, he captures a landscape that is ever-present, but unseen at any one time. The photographs give you that initial ‘wow’ from visualizing in a single frame what can not be physically seen at once, but, as one looks, the images go much deeper. I could try to explain the images in my own words, but it would not match the eloquent description by the photographer himself, who said that "In landscape I see a revelation of how pure spirituality has descended into physical existence ... These are the scenes, on the human edge of the cosmos, that I am showing in these photographs." Also on the mark is an excerpt from, of all places, Astronomy Magazine in June of 2002 (unfortunately I can not find the article in its entirety anywhere on the internet), where it was written that "The genius of these images is not in the revelation of any new truth, but in the expression of unsolvable equations. We are shown both realms of the visible universe, Earth and sky." This is a book that one can sit down with for long periods of time. Some time ago it was said, I believe by Minor White, that to begin to understand a photograph one should start by looking at it for at least 30 minutes. The images in this book merit that type of time commitment. When I started this blog I had decided not to use any photographs without permission. I e-mailed Mr. Folberg to ask to use a low resolution image, but did not receive a response and don't know if he actually received the e-mail, since it went to a gallery. Having at least made the attempt, not receiving a response, and with the suspicion that all is well with the use of one or two images in a review, I am posting two images from the book that I downloaded from the internet in order to whet one's interest. More images from the monograph can be seen either here or directly on Mr. Folbergs website here , by clicking on ‘Books’ at the top and then “View Photographs” under Celestial Nights in the left frame. The book is available through Amazon here.